Johnny Wander - ECCC: March 1-4 2018, Seattle WA! Hi all! 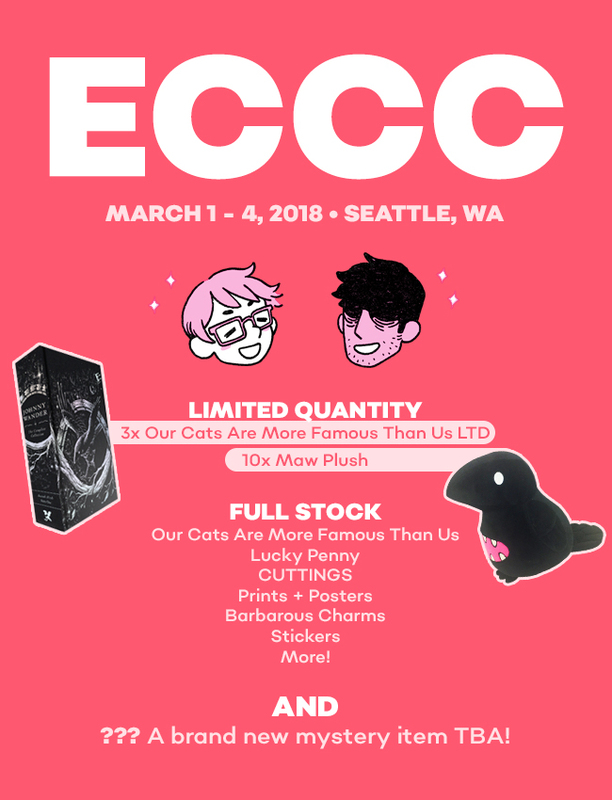 We're going to be at ECCC 2018! It's March 1-4 in Seattle, WA! We're going to try making updates like this a habit, so people who really want a particular item like a LTD edition book or a maw plush are able to swing by early and pick one up! Hopefully this will help some of you plan your stops. Hope everyone had a good end of 2017! We're back in 2018, and so is BARBAROUS! We're also happy to share that Yuko did the cover art for Faerie Fire, a 5E supplemental manual for tabletop campaigns! Faerie Fire is a supplemental in an 80s/90s neon retro style. Yuko had a great time working on it! There's a ton of stuff up in the store, just in time for the holidays! We previously added mugs, totes, charms and more! I'm happy to saw we also that we've also added 18x24" posters of the Barbarous chapter covers! Check it out along with everything else over at the store!